A recent graduate capstone project at Olivet Institute of Technology has developed a cross-platform mobile application tailored to the needs of churches, empowering them to spread the Good News by using the latest technology. More and more people are using mobile devices and tablets to surf the web. A standard church website is no longer sufficient to reach church seekers and provide spiritual resources for church members. A custom-built mobile application is becoming an essential strategic outreach tool for a small town church, a mid-sized suburban church, and a mega-church alike. But very often, many small to mid-sized churches are unable to access such tool due to lack of resources or the know-how among the congregation. 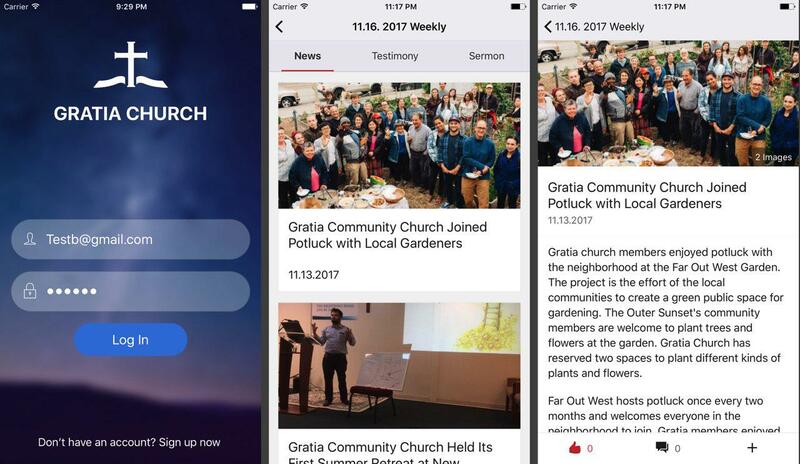 Created by OIT graduate student Jie Sun, the mobile application is designed for churches to publish their contents, such as newsletters, sermons, photos, and testimonies. It helps churches consolidate spiritual resources and communicate with both their congregants and a broader public, who may be interested in attending a church. The application is cross-platform, which means that the same code can be used on both the iOS and Android versions of the app. In the capstone project, Sun has applied one of the latest mobile apps building technology called React Native, which has high capability and outstanding performance. “Compared to hybrid ‘HTML5’ cross-platform frameworks, React Native has better native experience and better performance, without relying on the Internet. React Native is equipped with great debugging tools - the Chrome or Safari’s console/debugger, which most developers are familiar with. I am also able to inspect UI elements in the app, it’s one of my most favorite features,” Sun said. The app has both a web-based CMS (content management system) backend based on Ruby on Rails for churches to login and post their content, and a user-facing side represented by the downloadable app. Users can access all contents of a church website via the app. Sun has introduced the app to some local churches in San Francisco. One community church has begun trying out the beta version. The final goal is to submit to App Store and Google Play for free download. Apart from the technical skills required to develop the app, the capstone project represents the culmination of various skills that OIT students acquired during the entire course of their graduate studies. Specification development, proposal writing, wireframing, user feedback evaluation, project management, development, quality assurance (QA), and final product release are all part of this capstone project. “OIT faculty members congratulate Sun’s success in developing this meaningful mobile application. It can help narrow down the technology gap in Christian communities so that they can preach the Gospel to the network generation more effectively,” OIT San Francisco program director Ray Lei said.